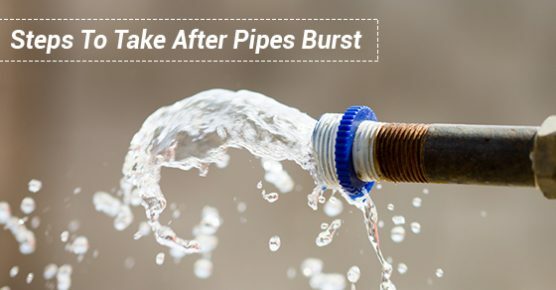 When your pipes burst, even the smallest crack can dump hundreds of litres of water into your house in a single day. Your house, your furniture, and your other belongings will be destroyed if you don’t act quickly, and you could face thousands of dollars in damage. You’ll be wet and miserable, with a huge pile of expenses ahead of you. This doesn’t have to happen to you. If you act quickly, you can save your house and your belongings. You’ll probably still get wet, but you won’t have to stress about massive repairs and replacements. Turn off your water supply right away to stop more water from flooding your home. If you can’t do this, call a plumber immediately. Shut down your power. If water is running out of your walls or ceiling, then that water has probably damaged your wiring. Go to your metre box, turn off your power, and call an electrician. Open all your doors and windows. You’ve already got quite a bit of water in your home. It’s going to pool, which will damage the structure of your home if you don’t remove it. Open all your doors and windows to dry the soaked area. Remove your belongings. Everything will dry faster if you take your furniture, electronics, documents, and décor to a safe place. You’ll also save your belongings from further water damage. If you take these steps, you’ll still have to pay to repair the pipe and clean up the mess, but you won’t have to replace your furniture or rebuild whole sections of your house. Insulate the pipes in the exterior walls and basement of your home. They’re exposed to the most cold and are most likely to burst, so some insulation will keep them warmer. Run water during the night. Running water won’t freeze as quickly as water that just sits there. If you run your sinks and showerheads at a slow drip during the night, your pipes are less likely to freeze. Leave your heater on when you go on vacation. If you leave it on, you won’t save money on your power bill, but you will keep your pipes from freezing and save yourself thousands on repairs. As long as you take all of these steps, you won’t have to face massive repairs in the middle of the winter. For more tips on how to protect your home, call Advanced Plumbing Drains & Heating today!